First-year Women’s Basketball guard/forward Daja Burnett wins awards for her performance this season. First-year Women’s Basketball guard/forward Daja Burnett has won three regional and national designations for her athletic and academic performance. The Maryland Junior College Athletic Conference—or MD JUCO—named Burnett to its 2017-18 All-Conference Women’s Basketball team. Burnett said she learned she made the team on social media before Women’s Basketball coach Lionell Makell had a chance to tell her. Burnett also made the National Junior College Athletic Association’s All-Tournament team for her performance during the Region 20 tournament in February, as well as its All-Region First Team for outstanding athletics and academics. Burnett, a music business student, averaged 18.1 points and 7.8 rebounds per game during the season. She made 40.8 percent of her shots. She ranks fifth among Women’s Basketball players at Maryland’s 16 community colleges for points per game. The athletic conferences base their All-Region and All-Conference teams on the student athlete’s performance in games and in the classroom. The All-Tournament team reflects performance during a specific tournament. 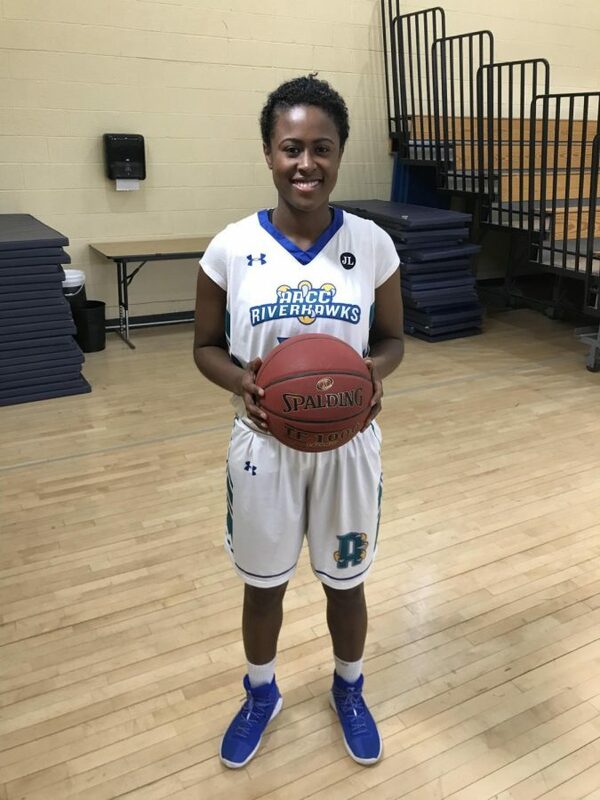 Burnett recorded six double-doubles this season and scored a season high 35 points in the game against Community College of Baltimore County-Catonsville. She said she has a 3.5 GPA. She said she plans to attend Middle Tennessee State University next fall. Two other Riverhawks won honorable mentions on the team: guard Jordan Graham, a second-year exercise science student, for Women’s Basketball; and guard Terry Kenner, a first-year business management student, for Men’s Basketball.